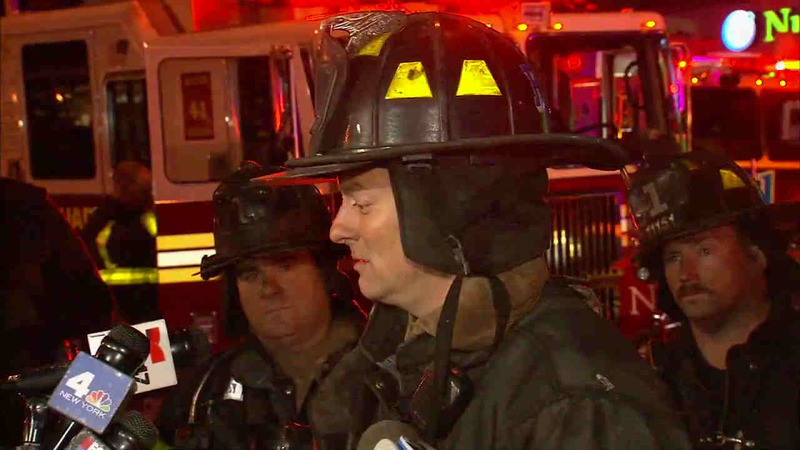 NEW YORK -- A firefighter lowered from the roof of a burning Upper East Side apartment building rescued a man during a six-alarm fire that killed one person. The dramatic rescue came during the fire that destroyed an entire apartment building on East 93rd Street. Firefighters spotted the 81-year-old man hanging out his fifth window and yelling for help just before 3:30 a.m. Thursday. They tied a rope around firefighter Jim Lee of the New York City Fire Department's Rescue 1, who was battling the blaze from the roof, and lowered him down to rescue the man. "You couldn't see anything over the edge, there was so much smoke and flames going out the window," Lee later said. Although blinded by the heavy smoke and flames, he was able to grab the man and they were both then lowered to the ground to safety. "I told him to stay calm and when we got down, I said, 'hope you enjoyed the ride.' He sort of smiled and he was thankful," Lee said. The man suffered serious burns and was rushed to New York Presbyterian Hospital/Cornell where he is stable. "The chief told me he was in critical condition, but he was able to talk to me," Lee said of the rescued man. After they got to the ground, the rope broke. It had been burned through by the flames shooting out the windows. "This is the type of rescue that is really extraordinary," FDNY Chief of Department James Leonard said. "He really put his life at risk. It doesn't happen that often in this department, maybe once every couple years, that we have a member who puts his life in this position and save a life because of their teamwork, their training and their bravery."